New research reveals the mechanisms behind the effects of chronic stress and tiny inflammations in the brain on fatal gut failure. Micro inflammation developed at specific sites in the brain (top panel). 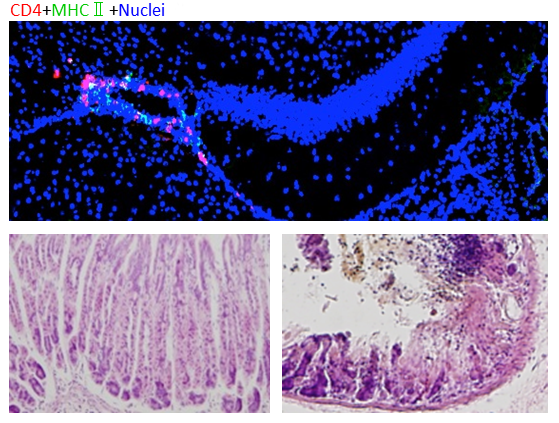 Pathological analysis of the stomach showed damage to tissues in the stomach (bottom right) compared to mice not under stressful conditions (bottom left). Hokkaido University researchers revealed that fatal gut failure in a multiple sclerosis (MS) mouse model, EAE, under chronic stress is caused by a newly discovered nerve pathway. 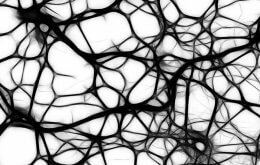 The findings could provide a new therapeutic strategy for the intractable disease, particularly progressive MS, which has no therapeutic strategy at present. MS affects an estimated 2.5 million people worldwide and causes motor dysfunction, impaired vision and gastrointestinal failures. It is an autoimmune condition of the central nervous system (CNS) mediated by immune cells called autoreactive CD4+ T cells. In EAE mouse models, these pathogenic CD4+ T cells can cause a MS-like disease when transfused intravenously to healthy mice. In previous studies using EAE mouse models, Professor Masaaki Murakami of Hokkaido University and his colleagues revealed autoreactive CD4+ T cells cross the blood-brain barrier at specific sites and cause inflammation in the CNS including the brain and spinal cord. The emergence of a “gateway” for autoreactive CD4+ T cells to cross the barrier was caused by regional neural activation at those sites, which is triggered by specific sensory-sympathetic interactions. They termed these phenomena as gateway reflexes and have published on at least three, the gravity-, electric-, and pain-gateway reflexes. In the present study, the team and their collaborators in Japan and Germany investigated the possible relations between chronic stress, micro-inflammation in the brain, and stress-related organ failures. They put healthy mice under stress by disturbing their sleep or by rearing them on wet bedding. The transfer of pathogenic CD4+ T cells under the stress caused severe symptoms such as gastrointestinal failures and even sudden death. Cell transfer or stress alone did not cause these symptoms. Subsequent investigations revealed a complex nerve-related mechanism behind this process. The injected pathogenic CD4+ T cells accumulated around blood vessels in two specific sites at the center of the brains of the stressed mice. Micro-inflammation developed around specific blood vessels, and the inflamed sites then released a small molecule called ATP that switched on a nerve pathway that is normally turned off. This switch led to gut dysfunctions, bleeding and failure. Also, the bleeding led to increased levels of potassium in the blood, which was one of factors leading to heart failure. The team was able to prevent gut failure by suppressing inflammation in the brain or blocking nerve pathways from the brain to the gut. The results suggest that tiny areas of inflammation around some specific vessels in the brain, which are known to happen in various brain diseases including multiple sclerosis, are a risk factor for organ dysfunctions including severe gut and heart failure. Arima Y., et al. Brain micro-inflammation at specific vessels dysregulates organ-homeostasis via the activation of a new neural circuit. eLife. August 15, 2017.